Laparoscopy (from Ancient Greek Î»Î±Ï€Î¬ÏÎ± (lapara), meaning "flank, side", and ÏƒÎºÎ¿Ï€Î­Ï‰ (skopeÃ³), meaning "to see") is an operation performed in the abdomen or pelvis through small incisions (usually 0.5â€“1.5 cm) with the aid of a camera. It can either be used to inspect and diagnose a condition or to perform surgery. Features : The laparoscope allows doctors to perform both minor and complex surgeries with a few small cuts in the abdomen. There are a number of advantages to the patient with laparoscopic surgery versus an open procedure. These include reduced pain due to smaller incisions and hemorrhaging, and shorter recovery time. 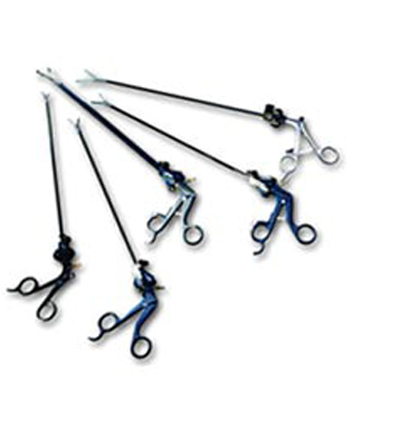 Types There are two types of laparoscope: (1) a telescopic rod lens system, that is usually connected to a video camera (single chip or three chip) (2) a digital laparoscope where the charge-coupled device is placed at the end of the laparoscope, eliminating the rod lens system.